The president welcomes the alliance's decision to recognise Kyiv's aspirations. President Petro Poroshenko has welcomed NATO's "long-awaited and logical" decision to recognise Ukraine's aspiration for gaining full membership in this organization. "This was a recognition of the true state of our relations with NATO, which was exactly what was discussed during my last meeting with the NATO secretary-general in Munich, as well as during a recent telephone conversation with the US vice president. I am grateful for the firm support of Ukraine, one of whose key priorities of national security is to achieve the criteria for membership in the alliance," he said on Facebook. "Our next ambition is the Membership Action Plan (MAP) for Ukraine, which I said in my letter to Jens Stoltenberg in February 2018, where, with reference to Article 10 of the Treaty on the Establishment of NATO, I officially asserted Ukraine's desire to become a member of the alliance. Silent diplomacy on the promotion of our principled position, as agreed with our partners, gives us tangible results. We are confidently moving forward!" Poroshenko added. On the evening of 9 February, NATO officially recognised Ukraine's aspiration to become a full member of the alliance. Earlier, the alliance believed that Ukraine "has no formal aspirations for membership." 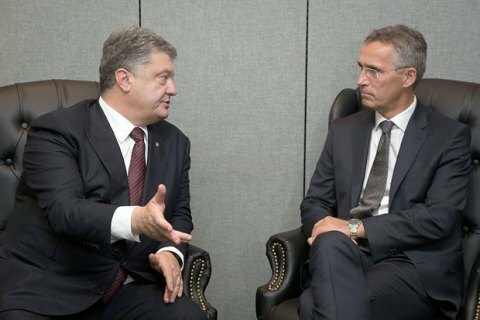 Ukraine applied for NATO Membership Action Plan back in 2008 at the alliance's summit in Bucharest, but Germany and France blocked the decision. The North Atlantic Treaty requires the consent of all NATO members to accept a new member.